Professor Haase’s group and other laboratories have shown that short-term pharmacologic inactivation of HIF-PHD oxygen sensors in animal models of renal ischemia reperfusion injury (IRI) has great therapeutic potential for the prevention of acute kidney injury and its long-term sequelae. As part of this effort the Haase laboratory has discovered that the renal endothelial PHD2/HIF-2 axis plays a critical role in the regulation of inflammation and microvascular homeostasis following IRI. The Haase laboratory established that the activation of hypoxia responses in renal endothelium modulates inflammatory responses in the context of acute kidney injury (Kapitsinou et al., JCI 2014). 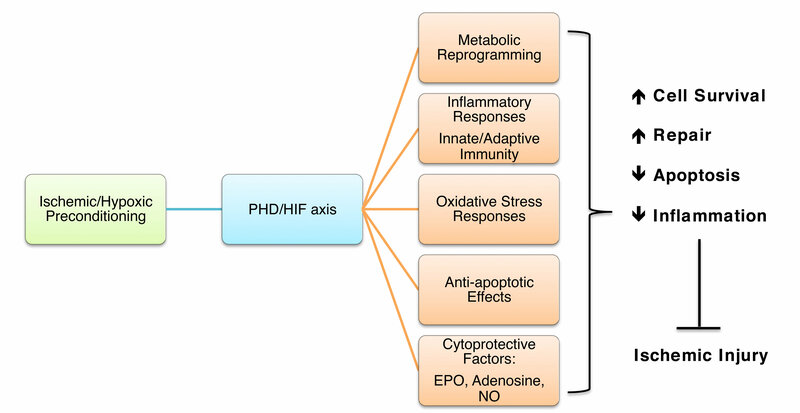 Molecular mechanisms implicated in PHD/HIF-mediated renoprotection induced by ischemic pre-conditioning. HIF attenuates IRI through coordinated activation of cytoprotective signaling pathways. 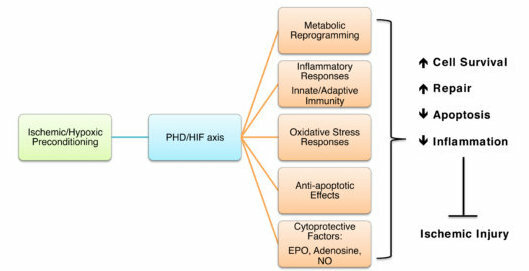 Shown are oxygen-regulated biological processes and signaling pathways with key roles in PHD/HIF-mediated renoprotection. Kapitsinou PP, Sano H, Michael M, Kobayashi H, Davidoff O, Bian A, Yao B, Zhang MZ, Harris RC, Duffy KJ, Erickson-Miller CL, Sutton TA, Haase VH. Endothelial HIF-2 mediates protection and recovery from ischemic kidney injury. J Clin Invest. 2014 Jun;124(6):2396-409. PubMed PMID: 24789906; PubMed Central PMCID: PMC4092875. Kapitsinou PP, Jaffe J, Michael M, Swan CE, Duffy KJ, Erickson-Miller CL, Haase VH. Preischemic targeting of HIF prolyl hydroxylation inhibits fibrosis associated with acute kidney injury. Am J Physiol Renal Physiol. 2012 May 1;302(9):F1172-9. PubMed PMID: 22262480; PubMed Central PMCID: PMC3362175. Kimura K, Iwano M, Higgins DF, Yamaguchi Y, Nakatani K, Harada K, Kubo A, Akai Y, Rankin EB, Neilson EG, Haase VH, Saito Y. Stable expression of HIF-1alpha in tubular epithelial cells promotes interstitial fibrosis. Am J Physiol Renal Physiol. 2008 Oct;295(4):F1023-9. PubMed PMID: 18667485; PubMed Central PMCID: PMC4250235. Biju MP, Akai Y, Shrimanker N, Haase VH. Protection of HIF-1-deficient primary renal tubular epithelial cells from hypoxia-induced cell death is glucose dependent. Am J Physiol Renal Physiol. 2005 Dec;289(6):F1217-26. PubMed PMID: 16048903.